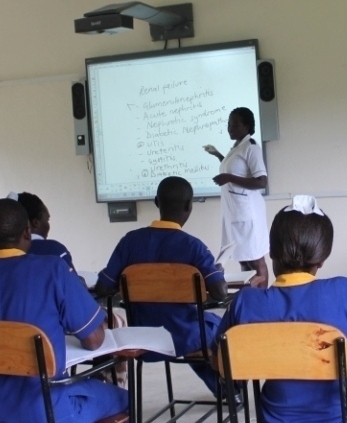 Uganda Nursing School Bwindi (UNSB) UCU - affiliate is located in Buhoma at the foot of Bwindi Impenetrable Forest in Kanungu district, and it is approximately 540km from Kampala, the capital city of Uganda. The school was started in November 2013 by Bwindi Community Hospital, under the Diocese of Kinkizi, and two major benefactors Steve Wolf and James Jameson who had come as tourists. The school was furnished with support from Rotary International. UNSB offers diplomas and certificates in Nursing and Midwifery. These programs are enriched with obstetric sonography as a package for diploma students. The school is in strategic partnership with Universities of Vermont, Scranton, Dominican, Stanford and San Francisco. All these have contributed towards a learning environment favourable for students to excel. The Nursing school started with 13 students and now has an enrolment of 200. It was started with an aim of responding to the shortage of health workers in this and similar communities, and contribute to innovation towards extension of health services to the underserved rural communities in Africa. Bwindi area is located in Kanungu District in a very remote, rural, hard to reach area with very poor, impassible marrum roads. The area comprises of very a poor, uneducated and underserved community. The most underserved Bwindi community being, one of the most rural hard to reach parts of Uganda far away from the capital city and urban faces a number of challenges. These range from lack of good and enough education to health facilities. Coupled with these, the community faces a critical shortage of health workers. This underserved community comprises of the marginalized Batwa Pygmies and the original tribe the Bakiga. The shortage of Human Resources for Health is very critical in the rural hard to reach, remote and poor parts of Uganda, which forms 80% of the total population. Most of the health workers are located in urban. As a result of this shortage of health workers, there is still unacceptably high maternal and infant mortality and high burden of preventable disease. With particularly few health workers, like midwives existing in the area, the process of prevention of transmission of diseases like HIV /AIDS and mostly the implementation of the programs aimed at prevention of transmission is a problem. 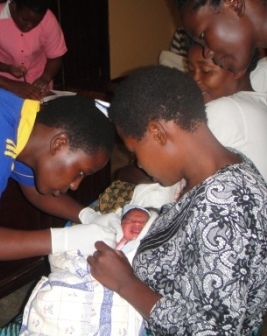 The critical shortage of midwives in Uganda further complicates the already existing problems. Family planning uptake between HIV positive and HIV negative women is very low with un met need of family planning being high (43%). Yet studies indicate that improved counseling sessions on family planning may be necessary to prevent vertical and heterosexual transmission of HIV, unplanned pregnancy, and to address fertility desires. This can be best done in the presence of a skilled health worker. For many students, continuing to become what they are even if they are willing is a problem because of poverty. The Ugandan education system and schooling is in such way that the best schools with best teachers is in urban and the products remain to work in urban places. This has left rural and remote places like Bwindi with no good school, no health care training school and yet this is where there is a big disease burden and the students are too poor to move far away. Basing on the experience rural students will have had, after completion of their studies, they are most likely to stay within the rural areas and provide services to the community. The nurse training school goal is to help such students. Currently UNSB is the only school training diploma in Nursing and Midwifery located in Kanungu where the Bwindi area is located. UNSB has been established by Bwindi community hospital the only hospital existing in the Bwindi area to respond particularly to the critical shortage of health workers. The shortage has been as a result of high turnover and failure to attract health workers in the Bwindi area because of its location. Two individuals from USA have built the school. The health workers shall be trained in the Bwindi Community and therefore they will be able to understand the community and learn to leave within the environment. At the end of their training we envision that these are the health workers who will be able to remain and serve the community thus reducing the critical shortage of staff. The training school is one of the kind, training students in a rural location making them get more familiar with the community and thus in the end remain and work in such a community. This will provide leverage on critical shortage of midwives and nurses from and within the community and then help reduce the burden of disease with in the community.